It’s well worth the 10 minutes of effort to make your own 3-ingredient ricotta gnocchi for this delicious baked gnocchi with sausage, peppers and tomatoes. Your meal will still be on the table in only 30 minutes! I remember the first few times I tried gnocchi. I wanted to like it, I really did, but it didn’t rock my world. Gloopy, bouncy, rubbery, boring are words that came to mind. 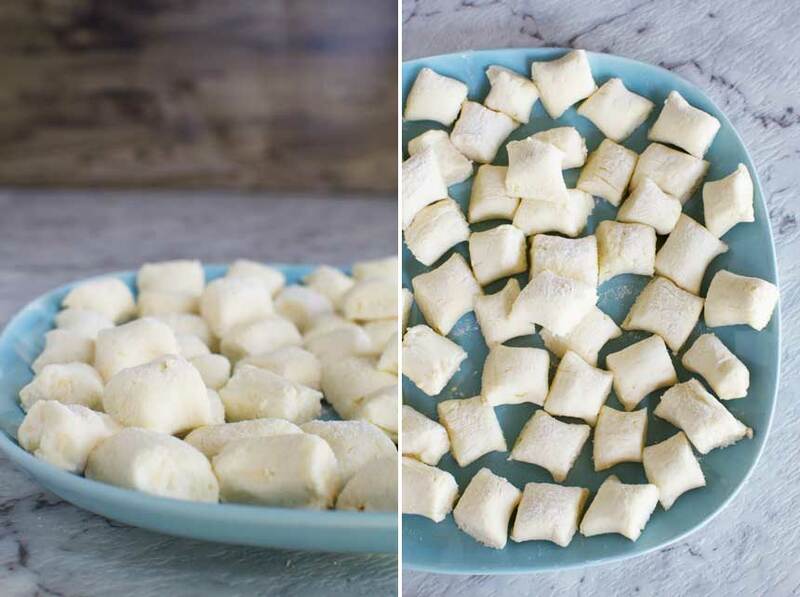 HAVE YOU EVER TRIED HOMEMADE RICOTTA GNOCCHI? I’ve made potato gnocchi a couple of times (once very disastrously with sweet potatoes when I added far too much flour – yuck). It was good and quite easy, but a bit too much hard work for my liking. But ricotta gnocchi is another matter. It’s EASY, guys. And I really mean easy. Like dump 3 ingrdients in a bowl, mix, roll and cut into gnocchi sized bits easy. Almost as fast as opening that supermarket package of gloopy potato gnocchi. So no eggs, and in my humble opinion it doesn’t suffer in the slightest for it. The gnocchi are soft, deliciously cheesy pillows. They don’t need salt either (hello salty parmesan cheese!) and I don’t even add pepper because I add that to the finished tray bake before serving. So this baked gnocchi with sausage, peppers and tomatoes is a combination of 2 recipes – one which I spotted in the latest edition of Australian Delicious Magazine and the other my own creation that has been in our regular meal rotation for ages. The first time I made this I used packaged gnocchi, thinking I’d save a bit of precious time. But as already explained I don’t think it saves that much time, as you’re waiting for your veggies to roast in the oven anyway. And in all honestly it is TOTALLY WORTH spending those few extra minutes while the vegetables are roasting mixing up those 3 ingredients and rolling out your own gnocchi. There is just no comparison to the store bought stuff. This homemade ricotta gnocchi gets 10 out of 10. 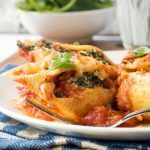 This is a perfect quick and easy weeknight meal. The sausage gives it loads of flavour. Just make sure you buy really good quality sausage. The roasted veggies add brownie points for health, and the tomatoes squish fabulously into your meal as you eat. In fact, you almost get a kind of simple sauce as the tomatoes slosh together with the olive oil, paprika and sausage juices. Am I making your mouth water yet? The icing on the cake is torn bits of mozzarella. Not essential but highly recommended! I like to sprinkle some fresh basil over the finished dish for a bit of contrasting colour and class, but this is optional too. You might be wondering how it’s possible to get this on the table in 30 minutes, but it is possible once you’ve practised once or twice! Roughly chop veggies and sausage and roast with tomatoes for 20 minutes. Meanwhile, make the quick and easy 3-ingredient ricotta gnocchi. 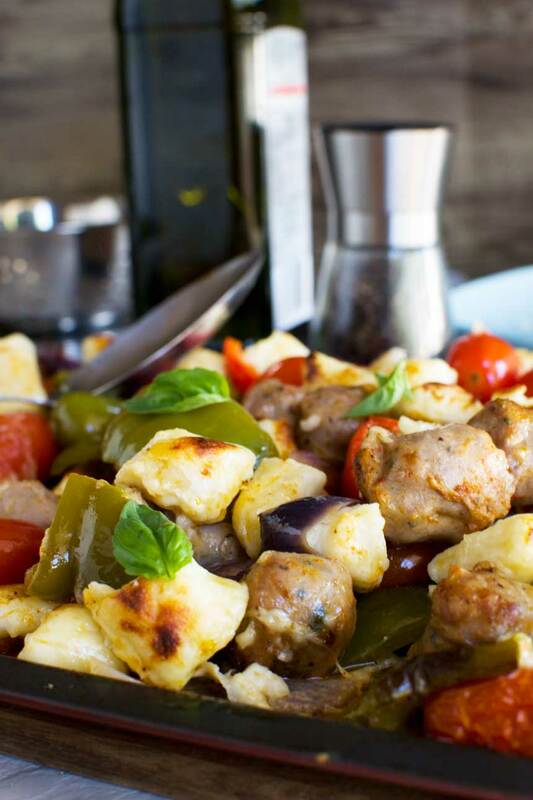 Scatter the gnocchi and mozzarella over the vegetables and sausage. Grill/Broil for a few minutes until golden and bubbling. Top with basil and more olive oil Mmmm! And of course you could VERY easily make this vegetarian simply by skipping the sausage. 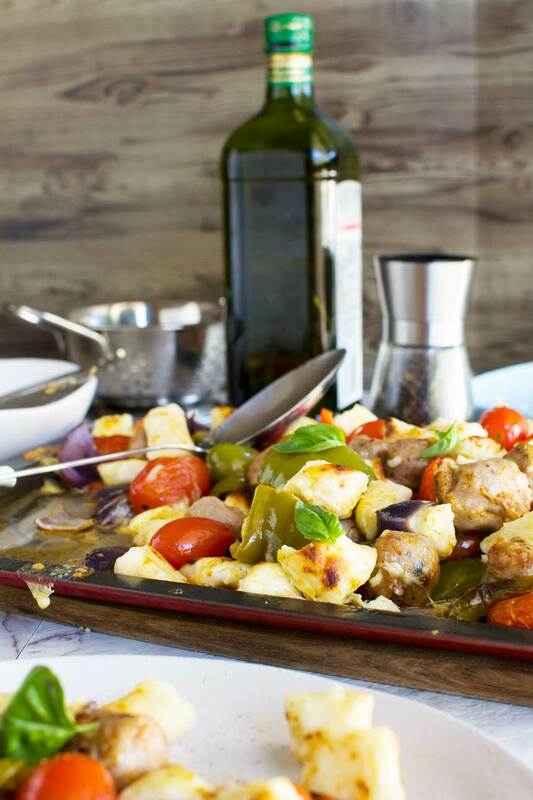 So this baked gnocchi with sausage, peppers and tomatoes is a pretty healthy and balanced meal all in all. And it’s low carb too, if that happens to be important to you. If you already know you’re a fan of gnocchi, I also have some more delicious gnocchi recipes on the blog. 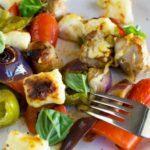 Two of them include packaged gnocchi, but you could easily substitute some of this homemade ricotta gnocchi! Enjoy! Crockpot chicken gnocchi soup (Olive Garden copycat) – this is one of the most popular recipes on the blog! 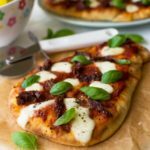 I like to use a large baking tray like this one (affiliate link) for this recipe. It’s a bit easier than trying to crowd everything onto a half sheet pan size tray! Are you a fan of gnocchi? I wasn’t always, but if you’re the same you may find this easy baked gnocchi with sausage, peppers and tomatoes converts you into a gnocchi lover! The gnocchi is made from only 3 ingredients, ricotta cheese, flour and parmesan cheese. No egg required! Just mix, roll and cut, then sprinkle over roasted veggies with a bit of mozzarella cheese for extra yum. On the table in only 30 minutes! Preheat the oven to 430F / 220C. Cut the bell peppers, onions and sausages into large pieces and scatter across a large baking tray. Add the tomatoes to the tray as well. Sprinkle over the paprika and olive oil, grind over some black pepper, then roast for 20 minutes. Meanwhile, mix the ricotta, flour and parmesan together in a medium bowl and bring together into a ball with your hands (*see important note below!). Roughly divide the dough into 4 balls. Then flour your hands and a big board or other surface and roll each ball out into a roughly 1-inch -wide log with your hands. Chop each log into roughly 1.5-inch lengths and transfer to a large plate. Cook in 2 batches in a large pan of boiling water until the gnocchi float to the top (a few minutes). Remove from the water with a slotted spoon and set aside. 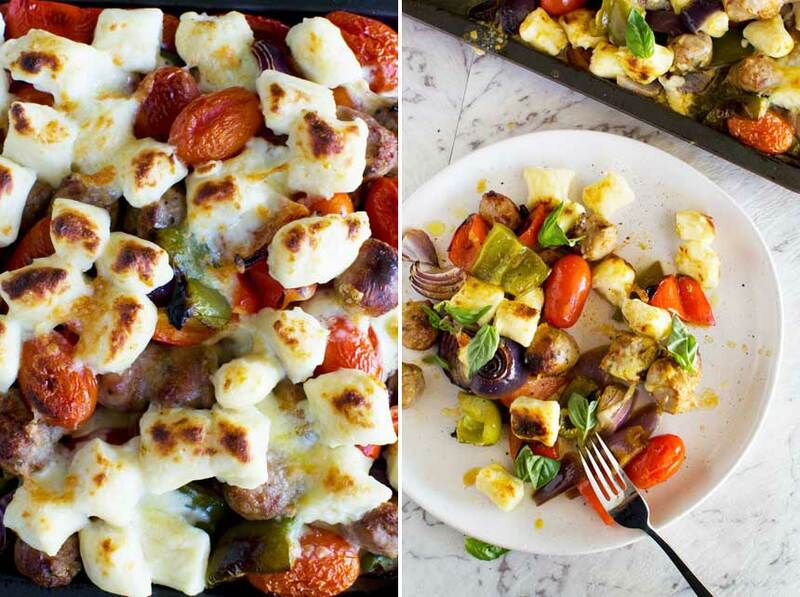 Remove your vegetables and sausage from the oven and scatter the cooked gnocchi and mozzarella over the top. Broil (US) / Grill (UK/Australia) for 5 to 10 minutes until the mozzarella is bubbling and the gnocchi are starting to go brown. Serve onto plates and drizzle with a little extra olive oil and scatter with fresh basil leaves. Gnocchi recipe based on a recipe by Matt Preston in Australian Delicious Magazine March 2018 edition. *The gnocchi dough will seem quite wet. Don’t worry! You should still be able to roll it into a log with your hands. 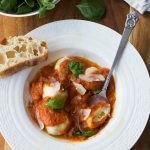 If however it really does seem too wet to roll, simply add a little more flour until you can roll it (as little as possible to be able to roll it – you don’t want your gnocchi to taste floury!). Just go with your gut when it comes to how much flour to add. Different brands of ricotta cheese can be a slightly different consistency. The gnocchi don’t have to be exactly the size stated in the recipe or even the same size as each other. The end result can be rustic! Can I make the gnocchi ahead? Err… no, not really. I’m speaking from experience! I tried making the gnocchi ahead and keeping them in the fridge until dinner time and they pretty much all melted into each other! The meal still ended up delicious but it took me ages to peel all the gnocchi apart from each other. I highly recommend NOT making them ahead. Just use the time the vegetables and sausage are cooking to make the gnocchi. It really doesn’t take very long! Can I reheat this meal the next day? Yes! I find this reheats really well and actually tastes even nicer for some reason. Just reheat for 15 minutes or so in the oven until everything is piping hot. If you are intending to reheat leftovers though do line your baking tray with baking paper in step 2 of the recipe above. Otherwise the juices make a real mess of your baking tray when you reheat! Holy cow this is legit easier than rushing to the store to buy it! AMAZING! I’ll for sure be making gnocchi so much more now! Hi Jen! Ha! Great, isn’t it? Me too! I worked in an authentic Italian restaurant as a teen and they prided themselves on their homemade gnocchi which was made with potatoes. (It was delish!) But I’ve never tried a ricotta gnocchi before. I love that it only has 3 ingredients and seems so much easier! Thanks for the recipe. There’s usually nothing like the lovingly made authentic version but hey, when you just want to get a delicious dinner on the table on a weeknight I’m willing to cut some corners! Hope you give this a try! You’re welcome, Emilie. Thank you so much for leaving your review! Love this combination of flavors, Helen and that you could make every bite a little bit different! Hi Marissa – thank you! So glad you like it!